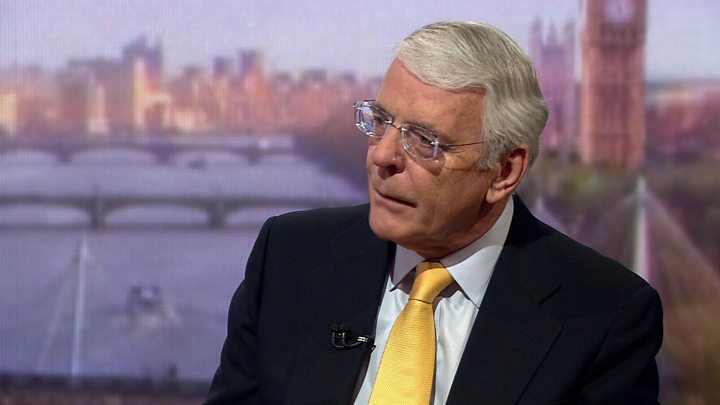 Former PM Sir John Major has hit out at the "squalid" and "deceitful" campaign to get Britain out of the EU. He told Andrew Marr he was "angry about the way the British people are being misled", accusing Vote Leave of putting out "inaccurate information". Conservative MP Boris Johnson stood by Vote Leave's figures, saying so-called "blue-on-blue" conflict should end. Matthew Elliott, director of the Leave campaign, said Sir John's comments were "sad" and "slightly mad". Sir John - a leading member of the Remain campaign - described Mr Johnson as a "court jester," who he suggested might not have the loyalty of Conservative MPs if he went on to become leader of a party he had "divided". He insisted he was not making a personal attack on the former London mayor but on the Vote Leave campaign as a whole, saying: "They are misleading people to an extraordinary extent". "They are feeding out to the British people a whole galaxy of inaccurate and frankly untrue information. "And what they have not done is tell us what would be the position if we were to vote to leave," he told Andrew Marr. He said Vote Leave had lost the economic argument and were now "veering" towards immigration, where "their campaign is verging on the squalid". Indeed, the bloke Spitting Image caricatured as being so boring, they did a skit of Sir John and his wife Norma eating peas, while having an incredibly boring conversation. But there wasn't anything boring about the former prime minister's interview this morning. I present you with eight words he used to describe the Leave campaign: Fundamentally dishonest. Squalid. Frankly fatuous. A deceit. Misled. So spoke a politician whose time as prime minister was defined by a chasm within his party over Europe; a chasm he helped widen today. His incendiary remarks about the NHS and what he saw as the malign intent of Boris Johnson, Iain Duncan Smith and Michael Gove, won't be forgotten quickly. Remember, all four men are in the same party. And whatever happens on June 23rd, that same party, the Conservatives, will still have to govern. He predicted "chaos" if Britain voted to leave in 23 June's referendum and claimed Britain would lose a "huge amount national income" through trade with Europe, adding: "These promises of expenditure on the National Health Service and elsewhere are frankly fatuous, they are a deceit." He claimed the NHS would be "about as safe" in the hands of Mr Johnson, Justice Secretary Mr Gove and former Cabinet minister Iain Duncan Smith as a "pet hamster would be with a hungry python". And he suggested Mr Johnson knew Britain's contribution to the EU, after a rebate and money back for farmers, was "about one third" of the £350m claimed on the side of his Vote Leave battle bus. Media captionBoris Johnson: "My view about the EU has changed, but that's because the EU has changed"
He said he feared the British people could vote to leave on the basis of "inaccurate information known to be inaccurate", which he regarded as "deceitful". But Mr Johnson told Marr the £350m figure was a "reasonable" one, arguing that, although some of it was returned by the EU, "this is money we cannot control," adding it could be spent on the NHS or other "one nation" priorities in the event of a Brexit. He said the Remain campaign had no "long-term vision for the economy" if immigration continued at its current rate. He predicted the UK's population could rise "inexorably", potentially as high as 80 million. Sir John also attacked Vote Leave's "depressing and awful" arguments on immigration, including the suggestion that 88 million Turkish people could "flood" into the UK if Turkey was given the right to join the EU. "Turkey will not be in the European Union for a very, very long time, if ever, and the Leave campaign know that. That's the point - they know that," he said. 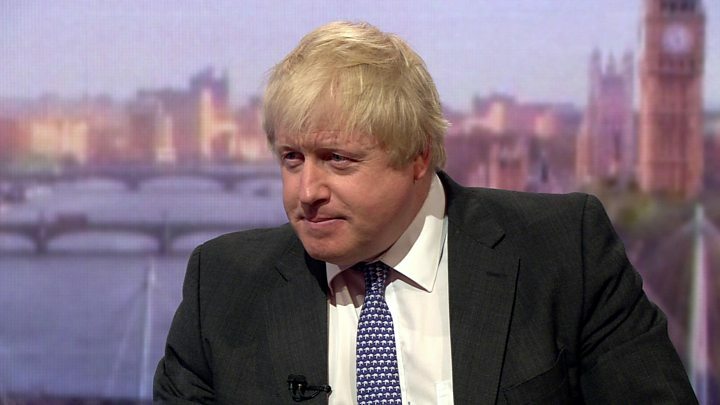 Mr Johnson hit back, saying: "Frankly, I don't mind whether Turkey joins the EU, provided the UK leaves the EU". Pressed on his previous support for Turkey joining the EU, he said "that was back in the days when some of us thought that widening the EU would not mean this federalising, centralising, deepening process that we have seen". "The EU has changed out of all recognition since people like me first started advocating Turkish membership," he added. Quizzed by Andrew Marr about a new Vote Leave poster saying David Cameron could not be trusted on immigration, Mr Johnson said it was "frustrating" the government was not meeting its manifesto commitment to reduce annual net migration to the "tens of thousands". Michael Gove also said on Sunday that leaving the EU would allow the UK to get net migration under 100,000 - a promise he said PM David Cameron had not been able to keep. Mr Johnson said he had hoped Mr Cameron could address this in his EU renegotiation, but that the PM "didn't get a sausage" from Brussels. He also said it was "absolute nonsense" that he was backing Brexit out of personal leadership ambitions. "Obviously there is going to be a temptation by one side or the other to try to turn it into a personality-driven conversation. "My view about the EU has changed but that is because the EU has changed out of all recognition." The Vote Leave campaign accused Sir John of resorting to "name calling" rather than "a serious debate about the issues". Conservative MP David Davis said Sir John had been sent out by Number 10 to "reduce the credibility of the Leave campaign's claims" but the figures he was "bandying about" on the Marr show were not accurate in themselves. He said Sir John's personal attacks on Mr Johnson and other Vote Leave figures were "harsh" and "I don't think very wise". "I don't think the public like it. After 23 June we've got to pull the party together, make it work and with that sort of attack it's a very bad idea," he told the BBC's Sunday Politics. Meanwhile, Labour leader Jeremy Corbyn has called on Vote Leave to say which EU regulations would "burn first" if Britain votes to leave. Addressing the GMB union conference, Mr Corbyn said campaigners had promised a "bonfire of regulations" the day after the referendum.